Canons (mostly instrumental) and Rounds (mostly vocal) can be traced as far back as the 11th & 12th century. Their reappearance in the folk and classical idioms throughout history suggest an undying vitality as a musical form. 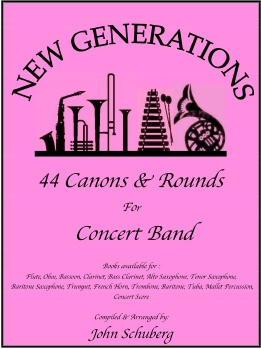 This collection of 3 and 4 part Cannons & Rounds is specifically designed for the young instrumentalist (Grades 6-9). They have proven to be invaluable for reading independent parts as well as ear training at the individual, sectional, and full ensemble level. Lyrics for the Rounds have also been provided for singing. All instrument books are in alike concert keys for full band use.